We are pleased to announce that OFID is now accepting applications for its 2017/2018 Scholarship. Kindly note that the deadline for submitting scholarship applications is May 1, 2017. Beware of scams implying association with OFID! There are various fraudulent schemes whose authors purport to be OFID personnel or agents, or otherwise associated with OFID. - Request for personal, business or confidential information as a precondition for any financial assistance it provides. 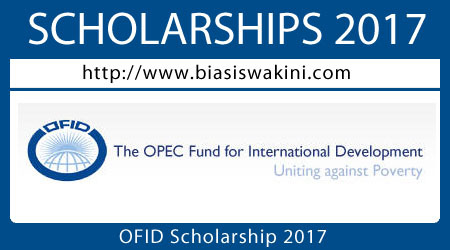 0 Komentar untuk "OFID Scholarship 2017"